'The gentle glow before bed'. A composition using the Rule of Thirds. Just about everyone who starts out in the visual arts learns this ‘rule’. Not that it’s actually a rule – more of a guide really. Photographers are no exception, the “Rule of Thirds” is here to stay as a way to help you improve your pictures. The idea has been around since it was first recorded by John Thomas Smith in 1797. It’s not a precise mathematical formulation. It is a visual guesstimate… a convention of good visual placement. 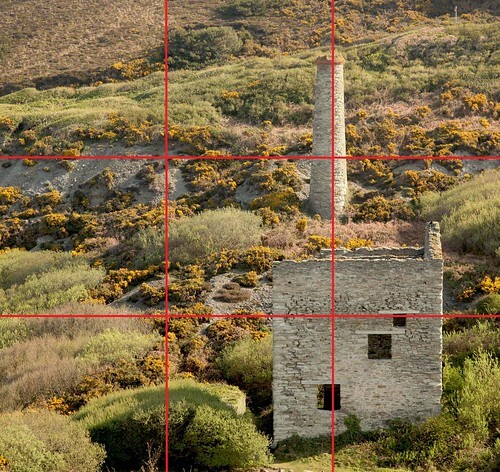 Painters, photographers and in more modern times, graphic artists, recognise that the rule of thirds helps you to appreciate a picture or design if the rule is applied. 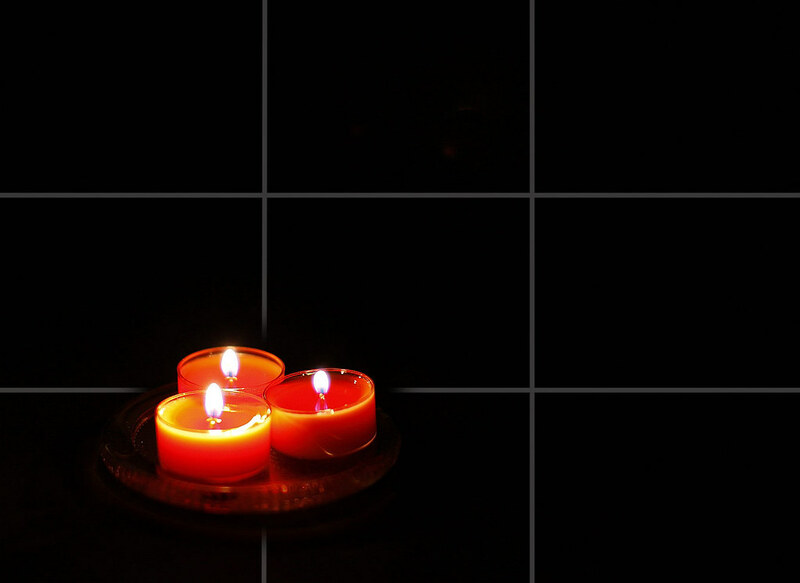 As you can see from the candle photograph above the picture is over-laid with an imaginary grid of four lines. Together the grid-lines divide the picture into nine equal parts. I have faded-out the lines where they intersect with the main subject of the picture. This shows how the subject is placed relative to the intersection. It is the intersections that form the most attractively placed points. However, the full length of the lines themselves carry appealing visual qualities when used to place elements of your picture. 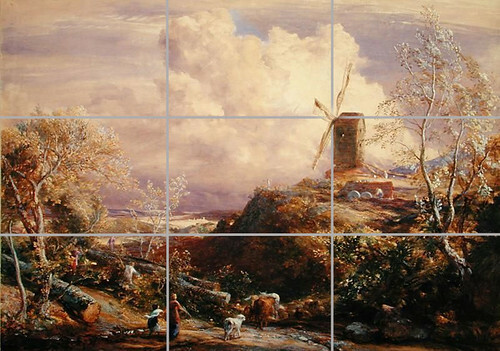 In the picture below I have laid the ‘Thirds’ grid over a picture by the famous English Painter, John Constable. He was a keen user of the rule and it can be seen in many of his pictures. The visual experience is enhanced by the use of the Rule. Windmill on a Hill with Cattle Drovers. By English painter, John Constable. The picture demonstrates that the old masters recognised the importance of the Rule of Thirds. You can see many features of the picture that conform to the ‘Rule’. At the bottom of the picture an adult and a child drive cattle. The first vertical line goes between them. As important elements Constable has placed them on the third. However, follow the line up and you notice the line traces the leading edge of the huge cloud in the sky. The important windmill is placed exactly so that the centre of the sails, the spindle, is placed on the intersection of the thirds (I have faded the intersection for visibility). You will also notice that the same horizontal windmill line cuts across the top of the tree on the left hand side of the picture. This implied line balances the picture nicely in that plane. The lower horizontal line also creates a third. It cuts both the trees at the point where the trunks split. The result is an implied line across the picture, creating a psychological balance. In the next picture the tin mine chimney is placed on a third. In this picture the line itself is the key to the location of the main subject on the third. There is no significant object that is appropriate for putting on the intersection. Blue Hills Tin Mine, Cornwall, UK. The mine chimney is shown on the 'third'. Click to see large. This composition works because the picture is relatively uncluttered and the single most important structure acts to pull the eye to it. This is why the Rule of Thirds works. Placing the main picture element in the dead centre, the eye would go straight to it. The picture would be weakened because there is no reason to be drawn into the picture once we are visually satisfied with the main object. We have a natural tendency to find symmetry and look for the important item in the centre. No central main feature and our eyes hunt the picture taking in the whole. Inevitably we are drawn to the thirds when a significant object is there. There is still a pleasing, and yet unbalanced symmetry, on the Thirds. The rule of the Thirds works because the eye is pleased with the symmetry, yet realises a visual tension from the off-centre displacement. We are drawn into the picture because of this dynamic. 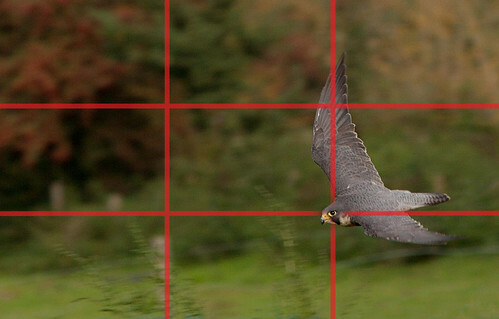 How do we use the Rule of Thirds? In almost any picture the eye or eyes of an animal or human are a very significant point. We are programmed to look to the eyes first. If you want to succeed with the Rule of Thirds consider putting an eye on one of the intersections. A nice sharp eye, especially with a nice catchlight (white reflective sparkle), is always a significant point which draws the viewer into the picture. In the next picture I tried to find two elements that help the placement. The eye is placed on one of the intersections. The upper wing of this swoop forms a long element along the line of the vertical. The picture is slightly balanced the other side by the fence post behind the left vertical line. It is blurry because the peregrine falcon at the bottom of its swoop is moving at about 200 kph (approx. 120 mph). Obviously, panning to take this shot was too fast to compose for the rule. So in this case the shot is cropped into the Rule of Thirds afterwards. Most image editor applications like Photoshop, Elements, Coral Paint etc. have crops with the rule of thirds grid built in. So it is easy to crop the shot to match the rule. A peregrine falcon swooping and showing the strong features of the Rule of Thirds. Try to place the eye on one of the intersections. This helps to balance the shot. Of course it is better, where you can, to compose in-camera for a shot. This saves on the post-processing. 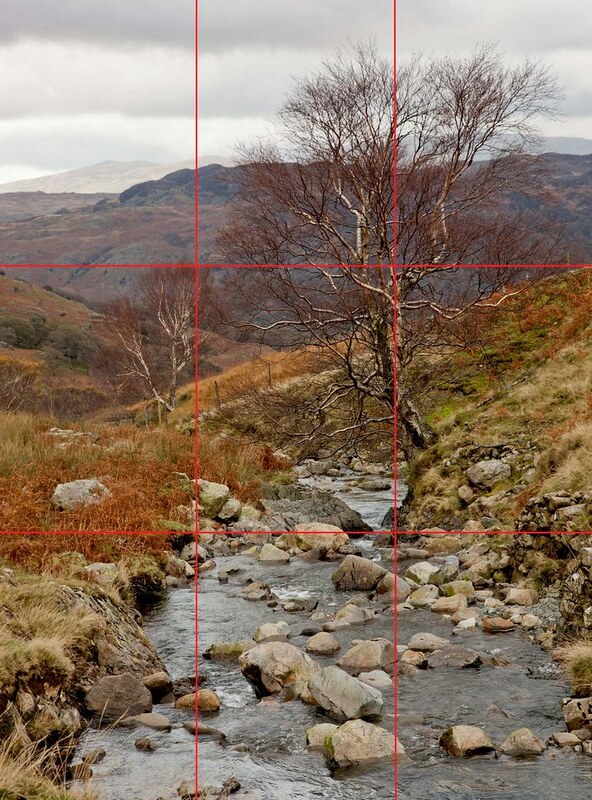 Fill the screen with your composition and use the grid or focus points to line up the elements for the Rule Of Thirds. It takes some practice, but it is worth doing. If your composition has a natural thirds symmetry you have probably got a strong image. Look for points of interest for the intersections and lines or bigger features to match a thirds line with… like a horizon, major feature, sea/land line and so on. In the final picture I have used the upland brook and the tree to be the major features on the third. The second tree down the brook a bit is nearly on the third. It serves to demonstrate that although the shot is not perfectly in line with the grid, it still works. The eye is not able to assess the situation to absolute accuracy. We are aiming to make the shot fall into thirds as nearly as possible. It still works even though it is slightly off the thirds. Don’t be slavish – the rule is a guideline. It is not a mathematical imperative! Honiston Pass in the English Lake District, UK. While the main feature is on the third, the minor feature which balances the picture is not quite on the other third. The picture works because there is still symmetry - it is close enough. Don't slavishly follow the Rule of Thirds. Click to see large view and no grid. The Rule of Thirds is a convenient convention to help us compose a pleasing shot. It works because the eye searches for symmetry and finds it pleasing when it exists. If you can compose to the Thirds you will be more likely to have an impact and draw the viewer into your picture. Have fun with this composition ‘rule’. It works, allows great creativity and it pleases the eye. This entry was posted in Background Info., Composition, How to..., Tips Tutorials & Techniques and tagged Emphasis, How it works, Rule, Rule of thirds. Bookmark the permalink.